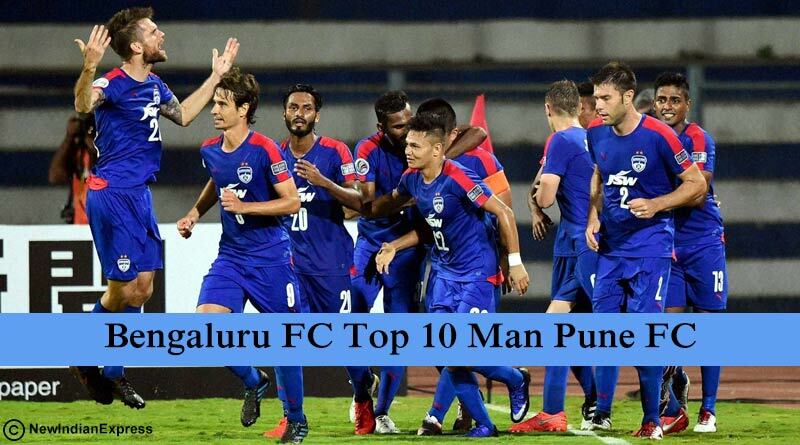 Bengaluru FC made the most of their man advantage as they defeated Pune FC on their home turf to win their clash in the Indian Super League. Despite conceding first, Bengaluru upped their game as they bounced back to score three and win 3-1. Pune’s fate was all but sealed after Baljit Sahni was red carded in the 56th minute to reduce the hosts to 10 men. With this being one of the most anticipated matches of the tournament, fans expected a slew of goals as Emiliano Alfaro and Marcelo Pereira vs. Miku and Erik Paartalu squared off against each other. It was a mouth-watering contest that saw the stadium being filled to capacity as football lovers in Pune reached the stadium in huge numbers to support their team. They were however left disheartened as their team ended the match empty-handed. Despite starting on the front foot and taking the lead in the 35th minute through Adil Khan, Pune destructed as they lost Sahni soon into the second half. The psychological damage of being a man down was too hard to cope for the Pune side who ended up conceding the equaliser to Miku who also went on to score his second of the night in the 84th minute. Sunil Chettri put the final nail in the coffin of Pune FC as he scored in the dying moments of the game to give Bengaluru a well-deserved victory. Pune started the game strongly, creating the majority of chances. Their efforts were awarded when Khan found the back of the net to round off a good move by the home side. Their joy came to an end in the second half though as Sahni ended up being asked to leave the field after receiving a red. From there on it was all Bengaluru as they controlled the match, bossing around possession 66%-34%. Their dominance of the ball ended up frustrating Pune who failed to find any holding in the game from then on and ended up losing 3-1.